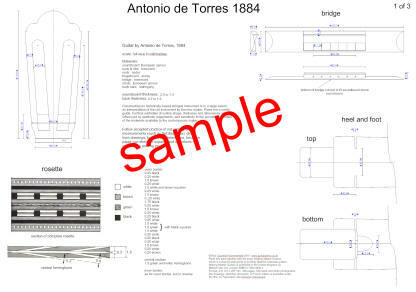 Torres is rightly seen as the founder of the modern Spanish classical guitar, and many experienced luthiers today still continue to make their guitars closely following the designs established by Torres in about 1850. This plan is also very suitable for someone making their first guitar, because it introduces the new maker to the basic design from which almost all later innovations have arisen. Before Torres, most guitars were fairly small, and not much thought had been given to the best method of bracing the top. Torres established a new strutting pattern of seven fan struts and two closing bars, which gave his soundboards the support they needed, at the same time allowing the wood to vibrate enough to produce a balanced sound. He also established an elegantly shaped guitar which, although smaller than some modern concert guitars, is very beautiful to look at. It is an ideal starting place for the modern guitar maker.